If I can rejoice for a moment, Death at an early age would still be a long life. Yuan Mei was born in Qiantang, Zhejiang province, to a cultured family who had never before attained high office. He achieved the degree of jinshi in 1739 at the young age of 23, was immediately appointed to the Hanlin Academy. 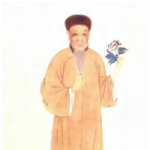 Then, from 1742 to 1748, Yuan Mei served as a magistrate in four different provinces in Jiangsu. However, in 1748, shortly after being assigned to administer part of Nanjing, he resigned his post and returned to his hometown to pursue his literary interest.